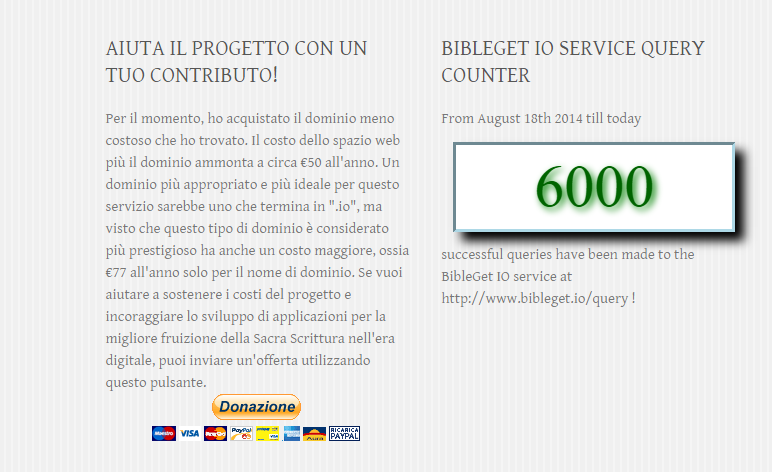 Today we reached the 6k mark in the queries made to the BibleGet I/O service! And we have some recent novelties: the Add-on for Google Docs has finally been published! Now anyone can use BibleGet in their Google document to insert Bible quotes in their documents. The Add-on is installable by searching for “BibleGet” among the available Add-ons (from the menu Add-ons -> Get Add-ons). Other than the publication of the Google Docs add-on, there’s another novelty: I’ve created a page for viewing statistics of the requests made to the BibleGet I/O service. Besides creating the general counter (viewable in the footer widgets of the website), I also began to record a quarter hour count of the queries made in that quarter of an hour, so I could understand better the trend and the use of the service. So now there is a graphic chart available which let’s you see visually the trend of the requests made in any given time period. There are a couple of errors in the recorded data: while the grand total is correct, those thousand and more requests shown for October 29 2014 were not all made within a quarter of an hour as it would seem, they are bunched together because it was the day of the transitioning of the server, and the quarter hour recording was interrupted for a number of hours until it was re-created on the new server. The result of this is that the requests made in the meantime all piled up and it seems like they were all done together but instead they were done over a number of hours. Perhaps I can smooth these statistics out manually by averaging them, but in one way or the other from today on the graphic chart will be stable in the results that are shown.